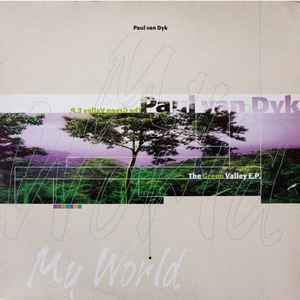 Paul van Dyk ‎– The Green Valley E.P. Co-produced & engineered at Mega Studios Berlin. Digital Mastering at Artephon Berlin. Thanks to Eberhard Köhler at Powerplay. Special thanks to: Cosmic Baby, Johnny Klimek and VOOV for their guidance, Annie Lloyd, Gudrun Gut, Alf and Jayney Klimek, Ben Hardiment and his video crew for all their hard work and of course the pretty girls for their patience - without you my video would be somewhat empty! Love to Florin, Ute and Felix, Marcos Lopez, Monika Dietl, Jürgen Cramer, Mijk van Dijk, Alex Kühne, Wolle, Patrick Pansensuppe, Tin Tin, Justin Robertson, Laurant & Eric, Michael Weiss, Sasha, Myra, Jason Bentley, Julie Jewels, Howard Schaffer, Keoki, Kris Needs, Inspirals & their crew and last but not least Frank, Torsten and Mark at MFS - thank you for your love and support and for just being friends. A-side: 127.123.7052.0 A2 Dmm G.P. B-side: 123.7052.0 B2 Dmm G.P. There exists a limited edition in green vinyl. Promo release has wrong cat number etched in the runout groove (MFS 123.7051.0): 7051 instead of 7052 (on the sleeve it's correct). Furthermore, on the promo version the track "A Love Letter" fades out at the end, unlike the version on the full release. Other than this, however, the mixes are identical. Matrix / Runout (Run-out Side A): 123.7052.0 A2 Dmm G.P. Matrix / Runout (Run-out Side B): 123.7052.0 B2 Dmm G.P.